Context: Neurosurgical patients following surgery or trauma are often monitored in an intensive care setting for a period of time. Studies with a comprehensive and predictive model of factors contributing to Intensive Care Unit (ICU) outcome following neurosurgical admissions are few in our environment. Aims: The aim of the study was to document the pattern of neurosurgical ICU admissions and predictors of outcome in our center for improved resource allocation and overall reduction in a poor outcome. Settings and Design: A retrospective study was conducted on adult patients admitted to ICU in 2015 with neurosurgical diagnosis. Subjects and Methods: Patient demographics, admission characteristics, details of neurosurgical diagnosis, ICU interventions, and outcome were obtained from the ICU record. Statistical Analysis Used: Data were analyzed with SPSS version 20. Results: Of 286 patients admitted in the study year, 95 (33.2%) followed neurosurgical indications. Twelve patients below 16 years were excluded leaving 83 adults in the review. Admissions following traumatic brain injury and intracranial tumor surgery each accounted for 35%. Although poorer outcome was observed in the traumatic brain injury, traumatic myelopathy, and clot evacuation groups, the difference was not statistically significant (P 0.34). Forty-two (50.6%) and 28 (34%) patients had ventilatory and vasopressor therapy, respectively. Only Modified Early Warning Score (MEWS) on admission predicted poor outcome (P = 0.04, β =1.63). Conclusions: Traumatic brain injury and intracranial tumor surgery were the main neurosurgical indications for ICU admission. A higher MEWS and lower Glasgow Coma Score on admission were observed among nonsurvivors, but only MEWS on admission predicted poor outcome. Several neurosurgical patients require Intensive Care Unit (ICU) admission, especially following traumatic brain injury or following surgical intervention. Such admission allows for early recognition of potentially serious complications, thereby facilitating prompt intervention and optimizing recovery. Stand-alone neuro-ICU care may be associated with better outcome for patients with neurological injury; however, general ICUs are relatively predominant in resource-poor settings like ours. In our center, we operate a 12-bedded general ICU, primarily manned by anesthetists. Neurosurgical admissions are mostly from the emergency department and the operating theater. Such admissions are approved by the consultant anesthetist following review. Unfortunately, studies with a comprehensive and predictive model of factors contributing to ICU outcome following neurosurgical admissions are few in our environment. This is often because of inadequate facilities that prevent proper severity scoring in the ICU, thereby limiting good across study comparisons. Hence, this review to reveal factors that can have impact on ICU resource allocation, cost-effective patient outcomes, and overall reduction in poor outcome. A retrospective study was conducted on all adult patients with neurosurgical diagnosis admitted to the ICU from January to December 2015. Patients below 16 years of age were excluded from the study. Patient demographics, admission characteristics, details of neurosurgical diagnosis, ICU interventions, and outcome were obtained from the ICU record and analyzed. To obtain a MEWS score, the admission parameters assessed were respiratory rate, heart rate, systolic blood pressure, temperature, hourly urine output (over the first 2 h), and level of consciousness [Table 1]. ICU interventions reviewed included elective ventilator therapy for postoperative patients or ventilator therapy for intracranial pressure control. Furthermore, vasopressor therapy with adrenaline, noradrenaline, or dopamine for hypotension not responsive to fluid and daily maintenance fluid (0.9% saline and 4.3% dextrose in 0.18 Saline) was documented. Complications developed, while in the ICU, for example, acute kidney injury was noted. SPSS version 20 (Chicago, Illinois) was employed for data entry and analysis. Categorical data were expressed as frequencies and percentages within categories, and continuous variables were given as means (standard deviation) or median (range). Univariate and logistic regression analysis was done to determine predictors of ICU nonsurvival. Significance level is set at P < 0.05. A total of 286 patients were admitted to the ICU within the study period. Ninety-five had neurosurgical indications representing 33.2% of all admissions. However, 12 of these were aged <16 years, leaving 83 adults in the review. [Table 2] shows the admission demographics and characteristics for all patients. Males accounted for 67.5% of admissions. Half (50.6%) and about 34% had ventilatory and vasopressor therapy, respectively. Mean ventilation days was 4.9 ± 5.8 and ICU length of stay was 7.7 ± 8.6 days. 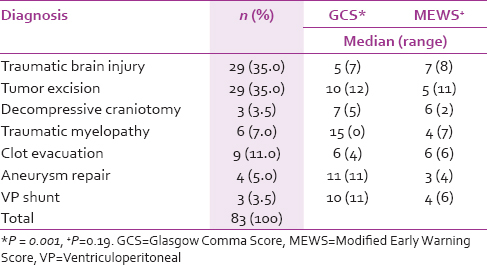 The median scores of Glasgow Coma Score (GCS) and MEWS on admission in each neurosurgical diagnosis are shown in [Table 3]. [Table 4] compares admission demographics and characteristics between survivor and nonsurvivor groups. 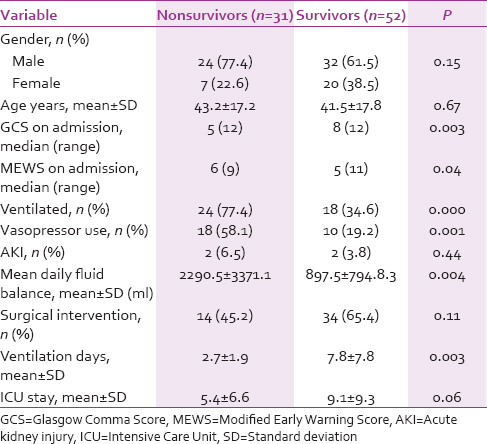 Univariate analysis showed significant differences between the survivor and nonsurvivor groups with regard to GCS on admission (P = 0.003), MEWS on admission (P = 0.04), ventilator therapy (P = 0.000), vasopressor use (P = 0.001), mean daily fluid balance (P = 0.004), and ventilator days (P = 0.003). [Figure 1] shows outcome in the different neurosurgical diagnosis groups. Admissions following traumatic brain injury and tumor surgery each accounted for 35% of neurosurgical admissions to the ICU [Table 3]. Although poorer outcome was observed in the traumatic brain injury, traumatic myelopathy, and clot evacuation groups, the difference was not statistically significant (P = 0.34) [Figure 1]. A lower GCS on admission was found among nonsurvivors, but it did not predict a poor outcome following logistic regression analysis. Only MEWS on admission predicted poor outcome with an odds ratio of 1.63 [Table 5]. Neurosurgical cases accounted for about one-third of ICU admissions in the study year. The 33.2% neurosurgical admissions obtained in this study is comparable to the 32% obtained in a 5-year review conducted at the ICU of Lagos University Teaching Hospital (LUTH), Nigeria. The pattern of ICU admission varies between developed and developing countries. While cerebrovascular disease accounts for the majority of admissions in the Western world, trauma and infections contribute largely to admissions in developing countries. 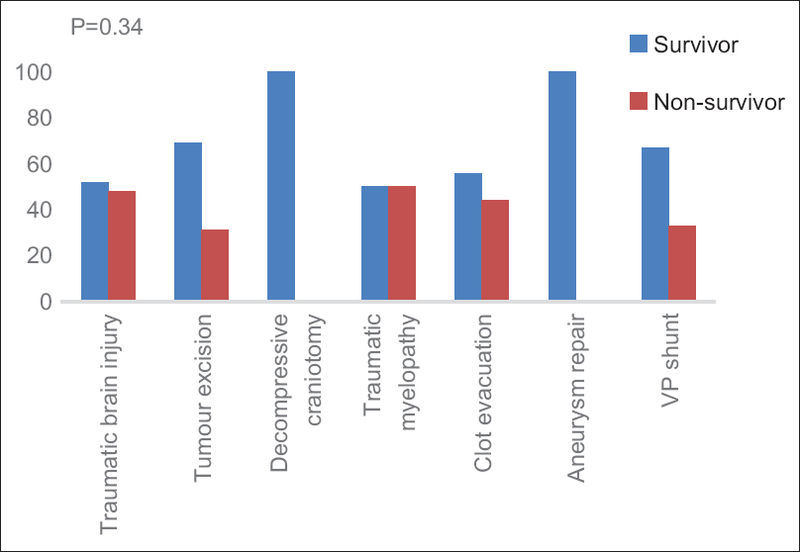 The 35% contribution to neurosurgical admissions by traumatic brain injury in our study is, however, in sharp contrast to the 55.5% and 77% obtained in the Nepal and LUTH studies, respectively. Bad roads and poor driving habits were cited as reasons for the high incidence of traumatic brain injury in the LUTH study. Posttumor excision surgeries made up 35% of neurosurgical admissions to the ICU. This translates to 10.1% of all ICU admissions during the study period. In a 5-year retrospective study done in Turkey by Uzman et al., postoperative neurosurgical cases accounted for 10.6% of all ICU admissions. Improved neuroimaging facilities and neurosurgical skills have translated to an increase in the number of intracranial tumor excisions placing higher demands on ICU bed space. In our center, admission of postsurgery patients is at the discretion of the attending anesthetist based on patient's preoperative status and perioperative events. Bui et al. found routine ward admission for patients undergoing elective craniotomies with selective ICU admission to be safe. Strictly embracing this approach of selective ICU admission following intracranial tumor excision would help reduce the demand for scarce ICU bed space. Observed mortality in this study was 37.3% and is close to the 23% and 26% mortalities observed in the Roka et al. study in Nepal and Tan et al. study in Singapore, respectively. A study that compared the mortality from Tunisia and France concluded that, though Tunisian patients were younger, the mortality was higher (22.5 vs. 17.5%; P < 0.01). Limited facilities due to economic constraints were given as reason for differences in ICU performances. Similar to this study, Roka et al. showed that mortality was highest in those ventilated for between 2 and 4 days, though not subjected to statistical test. A lower GCS and higher MEWS on admission were likewise observed in nonsurvivors. Gorji et al. in their study on patients with traumatic brain injury found that a one-score increase in GCS led to a 20.7% decrease in mortality and a 36.7% reduction in poor outcomes. However, only MEWS on admission predicted poor outcome, with an odds ratio of 1.63, in our study. MEWS is a physiologic score that assesses simple clinical parameters. Several modifications exist assessing different parameters. For this study, the parameters assessed and their scoring is as shown in [Table 1]. Both retrospective and prospective studies confirming the usefulness of MEWS as a predictor of ICU mortality exist., Oscarsson et al. and Ssemmanda et al. found a MEWS of 5 or more at admission to be predictive of poor outcome with odds ratios of 3.4 and 3.29, respectively. Similarly, Reini et al. found a MEWS of at least 6 to be an independent predictor of mortality in the ICU with an odds ratio of 5.5. In that study, the prognostic ability of MEWS on admission was comparable to that of Simplified Acute Physiology Score (SAPS) III. Although MEWS could prove useful as a rapid screening tool, particularly in resource-poor settings, it should not be seen as an outright replacement for the more advanced and established ICU risk scoring/mortality predictive models such as SAPS III, Acute Physiologic and Chronic Health Evaluation III, and Sequential Organ Failure Assessment score. Limitations of this study include the relatively small sample size and not employing other outcome measures such as 24 h mortality which can provide information about the quality of intensive care. Our low resource setting also made it difficult to obtain and utilize a standard severity scoring model for the patients which would have helped with patient comparison. Neurosurgical admissions made up a significant percentage of ICU admissions in our review, with traumatic brain injury and postcraniotomy for tumor excision being predominant indications. A higher MEWS on admission was predictive of poor outcome and may prove particularly useful for planning and resource allocation in resource-poor settings. Prospective studies utilizing standard ICU predictive models with larger sample size are needed. Tweedie I. Neuro-critical care versus general critical care for neurological injury: Beneficial evidence. J Neuroanaesthesiol Crit Care 2016;3:62-5. Poluyi EO, Fadiran OO, Poluyi CO, Alabi EO, Falohun SA. Profile of Intensive Care Unit admissions and outcomes in a tertiary care center of a developing country in West Africa: A 5 year analysis. J Intensive Crit Care 2016;2:3. Meena AK, Prasad VS, Murthy JM. Neurological intensive care in India – Disease spectrum and outcome. Neurol India 2001;49 Suppl 1:S1-7. Roka YB, Dhungana S, Shrestha M, Chaudhary A, Puri PR, Aryal S, et al. Profile of admissions to neurosurgical Intensive Care Unit: Experience from the only centre in Eastern Nepal. Postgrad Med J NAMS 2011;11:62-5. Uzman S, Yilmaz Y, Toptas M, Akkoc I, Gul YG, Daskaya H, et al. A retrospective analysis of postoperative patients admitted to the Intensive Care Unit. Hippokratia 2016;20:38-43. Bui JQ, Mendis RL, van Gelder JM, Sheridan MM, Wright KM, Jaeger M, et al. Is postoperative Intensive Care Unit admission a prerequisite for elective craniotomy? J Neurosurg 2011;115:1236-41. Tan WT, Choy JM, Foo JM. A 5-year profile of trauma admissions to the surgical Intensive Care Unit of a tertiary hospital in Singapore. Ann Acad Med Singapore 2010;39:363-7. Le Gall JR. The performance of intensive care services. Bull Acad Natl Med 2000;184:1653-63. Gorji MA, Hoseini SH, Gholipur A, Mohammadpur RA. A comparison of the diagnostic power of the full outline of unresponsiveness scale and the Glasgow coma scale in the discharge outcome prediction of patients with traumatic brain injury admitted to the Intensive Care Unit. Saudi J Anaesth 2014;8:193-7. 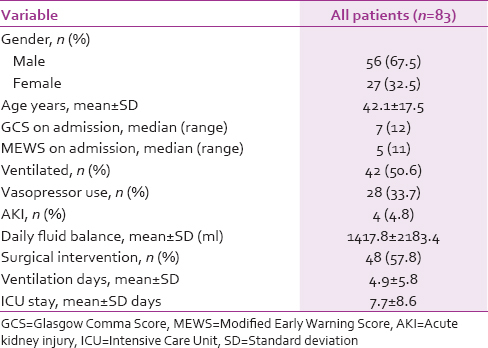 Oscarsson A, Reini K, Eintrei C. The modified early warning score predicts outcome in patients admitted to the ICU: 12AP7-2. Eur J Anaesthesiol 2008;25:180. Ssemmanda H, Luggya TS, Lubulwa C, Muyinda Z, Kwitonda P, Wanzira H, et al. Abnormal chest X-ray and MEWS as ICU outcome predictors in a sub-Saharan tertiary hospital: A prospective observational study. Crit Care Res Pract 2016;2016:7134854. Reini K, Fredrikson M, Oscarsson A. The prognostic value of the modified early warning score in critically ill patients: A prospective, observational study. Eur J Anaesthesiol 2012;29:152-7.